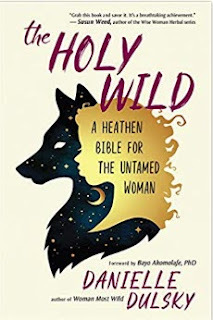 Today I'm reviewing The Holy Wild - A Heathen Bible for the Untamed Woman by Danielle Dulsky. Staring with basic review of the physical book. I was sent a soft cover to review. The outside is made of that soft material that feels almost like fur. Not my favorite. However, I was blown away by the index. A full seven pages front and back are dedicated to helping you locate what you need to find quickly in this book. Many author's overlook this. In my opinion any good book will after at least a minimal index but this one goes over and above with this massive listing. The book has no illustrations or images. The cover image is impressive and I really enjoyed the forward by Bayo Aromolaf, PhD. The chapters of the book are separated into books. Earth, Water, Fire, Air and Ether. Each include a section on verses and a section on rituals for each book. As my interest is piqued by Hecate I grabbed the index and found the Book of Ether, on page 212 was Hecate. I was a bit disappointed to see that Hecate was referred to as the Crone/Hag goddess. We know historically that all depictions of her have been of a maiden. Only early references to her by Aleister Crowley mention Hecate as a "hag". That stuck and many authors use that description of her. She is a triple goddess but not in the maiden, mother, crone construct. My favorite ritual by far in this book can be found on page 137. It's called "Our Shared Crucible: A Three-Part Ritual of Deep Transmutation. Further because of my interest in fire scrying I found the ritual "Pyromancy of the Prophetess: A Ritual of Divination by Firelight" to be extremely rewarding. Over all, I believe this is a great book for any witchy library and has an uplifting "self help" quality to is. It is empowering and showcases the untamed women of witchcraft.